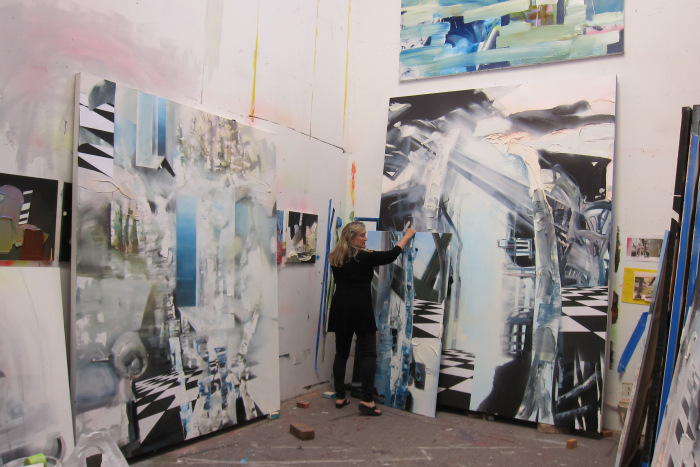 Studio Visit with Yvette Gellis. Photo Credit Gary Brewer. 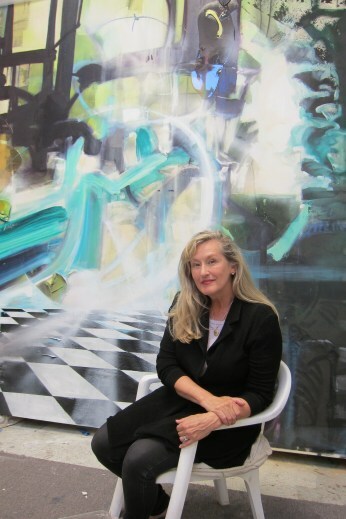 Her paintings are dramatic and complex. 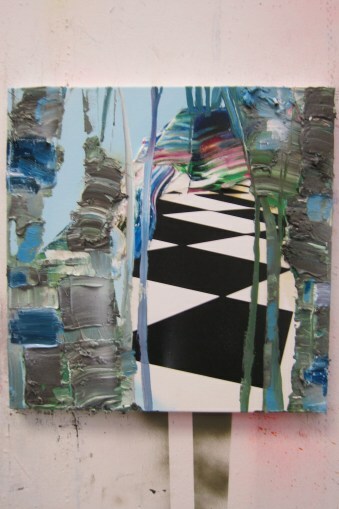 Space is fractured there is a sequence of imagistic non-sequiturs, “fragments of the world disappearing” that coalesce into paintings conveyed in bold painterly compositions. They have the virtuosic bravura of Abstract Expressionism but also suggest the things of this world; trees, furniture, buildings and perspective grids, elements that create an architectonic imagistic structure. The physicality of the medium moves freely from soft deep atmospheric space to thick physical brush loads of pigment that asserts their presence into our world. Yvette boldly claims her rights to the Abstract Expressionist vernacular. She is fearless and willing to fail spectacularly if needed to find the vision she is after. With sheer, confident power and force she channels her energy in an allover onslaught on vast canvases, whose scale also reference the abstract expressionist painters. 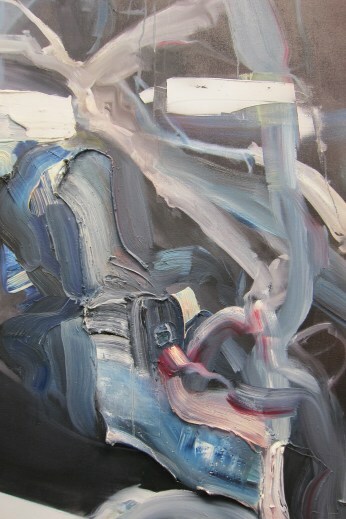 Bold passages of paint, laid on thick with broad brushes capture an immediacy and emotive force. Deep blacks, exquisite turquoise greens, lavender grays. There are pools of resin, thick passages of paint applied with palette knife, stains and loosely rendered ghost images from our world. She says of these ghost images, “they cannot be forced or too specific, they have to come naturally and just suggest the object”. All of these painterly approaches are anchored through a deep and true sense of compositional rightness, there is a feeling of some kind of ‘known’ space that allows us to enter; she draws us into Alberti’s window and shatters it. She believes that Abstract Expressionism ended prematurely with the advent of Pop Art, Minimalism et al, that there was more to say and especially through a female aesthetic vision. Indeed she has spoken of feeling as though she had been a thwarted women painter of that generation who passed away and that she has been reincarnated to follow through and complete this endeavor. As a young woman she and her brother were mountain climbers. She feels that the physicality, the risk taking and the intensity of that experience, that the struggle against the elements, gravity, fear and ones own weaknesses is expressed in her ambition as a painter. That she will make it to the top of the mountain. We spoke of her influences and she mentioned that upon first seeing Anselm Kiefer and his enormous physical paintings, the presence they exerted as well as encountering an object one could almost enter had a profound impact on her and made her realize that she shared an affinity with his work. 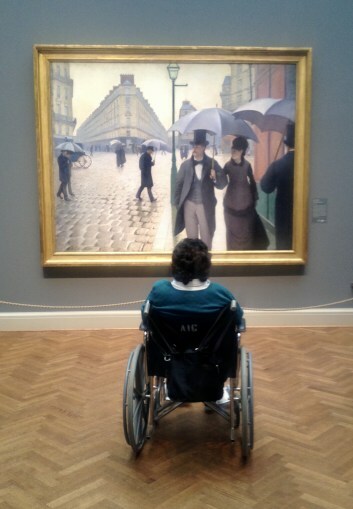 She also mentions Gustave Caillebotte painting, “Paris Street, Rainy Day”. She was raised near Chicago and as a child would visit the Chicago Art Institute with her mother, who was an artist and an art teacher. The steep perspective of the cobble stone street leaning toward the viewer, giving one the feeling that they can step into the painting, had a formative impact; the idea that one cold walk into a painting was already germinating in her mind at a young age. 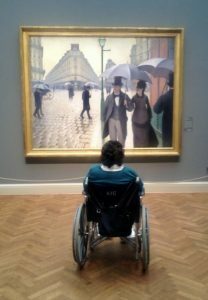 A photo Yvette took on a trip to visit her Mom shows her mother seated before the painting in her wheelchair. Looking at this photo it feels as though the street in the painting is set at an angle that if extended forward into space would be a plane on which her mother would be correctly sitting. It is an extension of the fictive space into our physical space. This principle is an idea that is expressed and amplified in the complex and colossal works of Yvette Gellis – indeed she has moved from the canvas and into actual space. Painting on sheets of plastic, on the floor, and on clear plastic tubes, to create installations where one is engaged in a continually changing relationship to the image/painting/object, as she put it one experiences “movement and duration”. In the spirit of Kurt Schwitter’s she seeks to create a “gesamtkuntswerk” a total work of art; however these are not mere novel innovations for their own sake but a engagement in a search for the truth, to express the reality that this world our bodies are temporal and that our spirit is the only true thing. 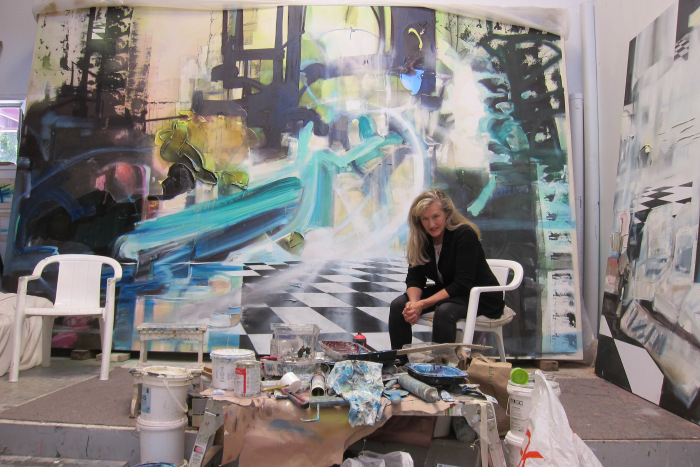 Yvette seeks the feminine sublime as a manifestation of her spiritual practice writ large in the bold, masculine vernacular of Abstract Expressionism. Her strong feelings about the history of women being excluded from painting, literature etc. imbues this approach to painting with a political stance, wielding it with a power to match any man she inflects it with a female vision. 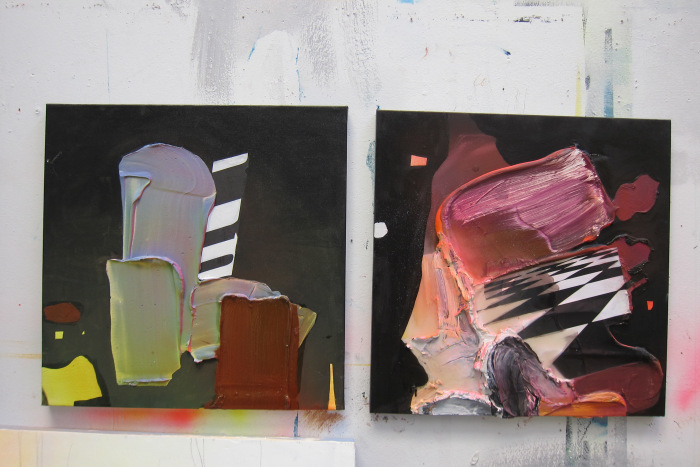 Painting is a philosophical idea expressed in a physical object in an image in an action. It conveys the duality of form and content, spirit and matter. The idea that truth and beauty can be expressed is needed in our world more than ever, not in an ideological sense but in a personal quest for meaning. “That is beautiful which is produced by the inner need, which springs from the soul” ~Wassily Kandinsky, Concerning the Spiritual in Art. Yvette Gellis is fearless in this quest, her painting express an ardent zeal to penetrate the illusion, to build scaffolding, a philosophical armature upon which she can climb her way out of the window and toward the light.